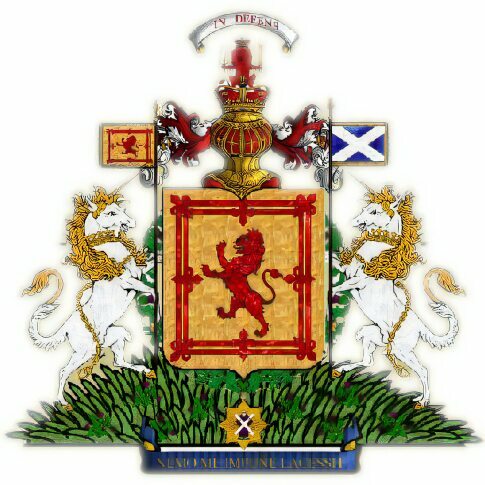 When the house of the great Robert the Bruce (1306-1329) failed in the male line in 1371, the throne of Scotland passed to his grandson in the female line, Robert Stewart, son of his daughter Marjorie Bruce and Walter Stewart and first of the romantic but ill-starred royal House of Stewart. The earliest recorded member of the House of Stewart was Flaald I, who was of Breton origins and was employed in the service of the eleventh century Lord of Dol and Combourg. Flaald and his immediate descendants held the hereditary and honorary post of Dapifer, or food bearer in the Lord of Dol's household. Robert II's grandson, James I (1406-1437), was to prove one of the ablest of Scotland's kings. When his great-great grandson James V (1513-1542) failed to produce a surviving male heir the crown was inherited by his daughter, the last scion of the House of Stewart, the beautiful but tragic Mary, Queen of Scots (1542-1567). Mary was suspected of complicity in the murder of her ineffectual husband, Henry Stuart, Lord Darnley and later alienated the Scottish lords by her subsequent marriage to James Hepburn, Earl of Bothwell, widely believed to be his murderer and was forced to abdicate. She ended her days under the executioners axe at Fotheringhay on the orders of her English cousin, Elizabeth I. The claims to the thrones of Scotland and England were eventually united in the person of her son, James I & VI (1603-1625) , first monarch of the House of Stuart and the first king of all Britain.